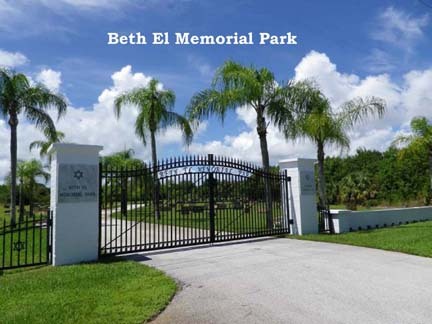 Beth El Memorial Park is a Jewish cemetery located in Fort Pierce and is the only Jewish cemetery on the Treasure Coast of Florida. Burials are in accordance with documented rules and Jewish law. Temple Beth El Israel membership utilizes this cemetery as it has for several decades, and many past members and their loved ones have been interred there. Plot owners are involved in the care and maintenance of the cemetery by participating in decisions and actions. These plot owners and future plot owners ensure perpetuation of the cemetery. Questions or needs of the cemetery should be directed to Temple Beth El Israel at 772-336-2424.